Synopsis iQ is in use today across NHS and Private hospitals – transforming pre-operative assessment for patients and hospital providers. 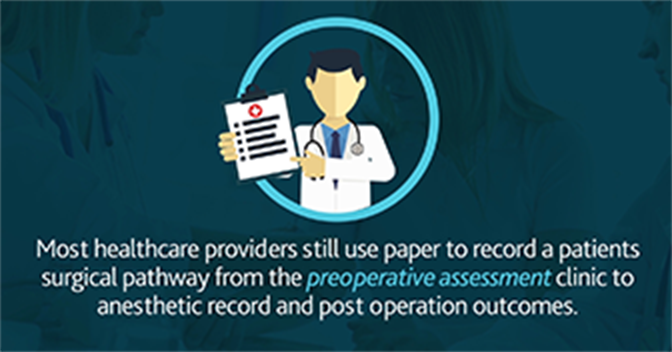 (2.6) Information from the patient’s Pre-Op assessment should be readily available, ideally as part of an electronic patient record so that information is easy to transfer between locations and to enable data collection for later analysis. (5.3) It is preferable for one-stop arrangements to be implemented so that patients can attend preoperative assessment during the same hospital visit as their surgical outpatient assessment. (5.20) Each hospital should have a system in place to identify high-risk surgical patients who require additional assessment. (5.26) Electronic systems should be considered to enable the capture and sharing of information, support risk identification and allow data to be collected and available for audit and research purposes. (5.34) Operating lists should be made available to the anaesthetist before the list starts. (6.2) A well-designed pre-operative service should minimise patient delays through the journey to surgery, while allowing appropriate time for initiation of interventions likely to improve patient outcome. By optimising planning of patient care, with the right staff and resources available, cancellations can be reduced and the efficiency of operating lists improved. If you are looking at modernising your preoperative assessment service, to improve the quality of care, reduce harm, reduce cost and improve efficiency, Synopsis iQ may well be the solution. What’s more, Synopsis is specifically designed to communicate with other IT systems in health. 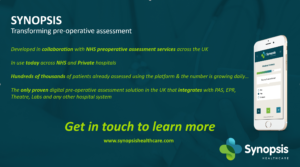 The only proven digtal preoperative assessment solution in the UK that intergartes with PAS, EPR, Theatre, Labs and any other hospitals system.